Can Reduce Eye Strain and Fatigue - Eye strain and fatigue can be greatly reduced by providing sufficient lighting for tasks such as reading, writing, or referencing documents. The ability to adjust both "Colour Temperature" as well as intensity means users can achieve the optimum level of illumination for any activity or task. Can Improve Sleep Patterns - The freedom to transition to a "warm" tone when working late can ensure that the body is better prepared for sleep rather than having been exposed to the cooler "blue" light which has been proven to suppress the production of sleep-inducing melatonin. 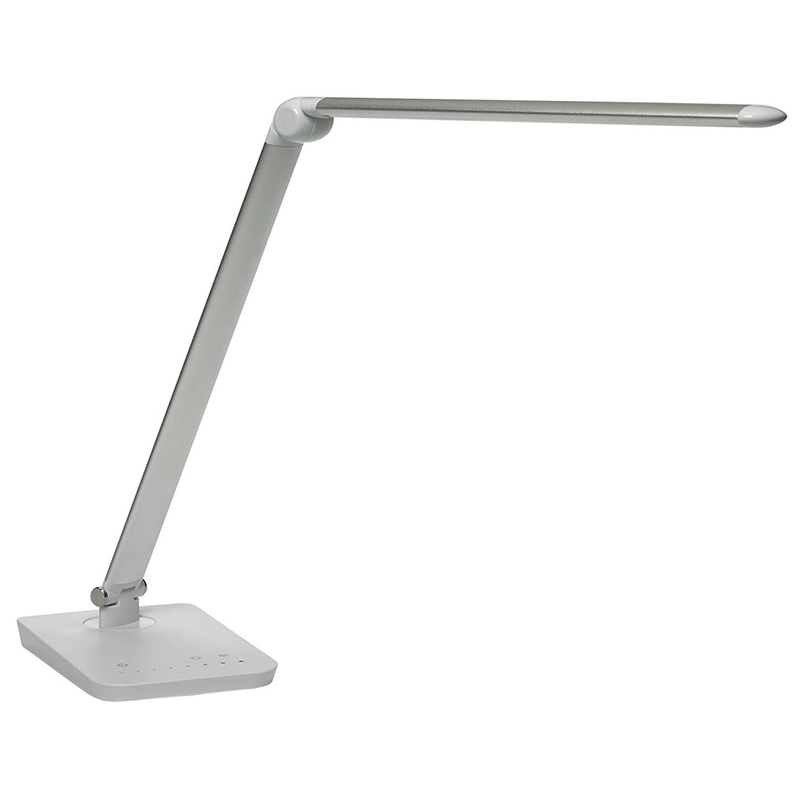 Reduces Glare - The softly filtered illumination produced by the Vamp LED Task Light reduces glare from the computer screen by allowing the user to focus the light only on paper documents and their worksurface. Reading from hard copy documents requires 4-5 times more light than reading from a computer screen. 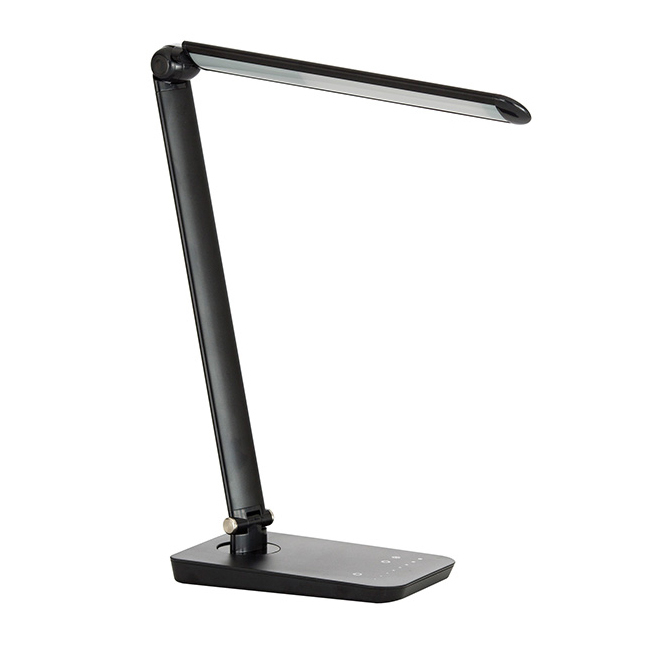 The rotating head on the Vamp enables users to adjust the direction of illumination to reduce glare and shadow issues to a minimum. Reduced Incidence of Computer Vision Syndrome (CVS) - Having the ideal amount of light for each task and reducing glare can greatly reduce the symptoms of CVS such as eyestrain, headaches, blurred vision, dry eyes, and neck and shoulder pain. Light Touch Adjustment - The Vamp requires minimal force to adjust which can be beneficial for users who are currently suffering from Repetitive Strain Injuries which cause pain in their fingers, hands, or forearms. Helps Improve Posture By Reducing Glare on the Computer Screen - Overhead lighting and light from windows can cause glare from a computer monitor. The glare from a computer screen may cause the user to move to awkward positions in order to avoid glare in their eyes. These awkward positions can lead to pain in the back, neck, or shoulders. Multi-Colour Rendering: The Vamp LED Task Light offers the unique capability to change the colour temperature of the emitted light with a simple touch. There are 4 varying degrees of "cool" or "blue" light as well as 4 levels of "warm" or "yellow" lighting available. Multi-Level Illumination: A simple 8-level touch strip offers variable lighting intensity regardless of the chosen colour rendering. Touch Activation: All controls on the Vamp LED Task Light are touch controls - requiring only a minimal degree of contact for activation. All controls are also readily accessible on the surface of the base for easy access. Flicker Free Illumination: By employing Direct Current the potential for irritating flicker is eliminated - resulting in a steady, sustained light level. 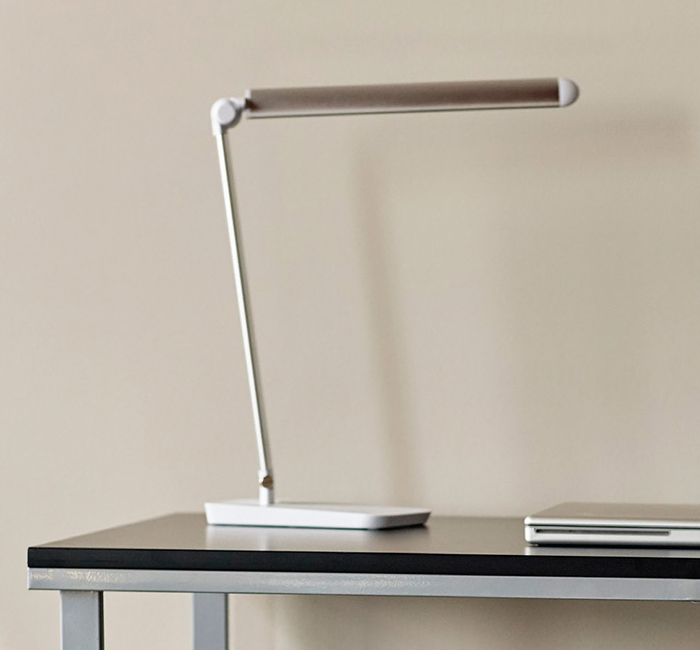 Effortless Adjustment: A pivoting base, dual articulating joints and pivot-equipped lighting head enable users to adjust the Vamp LED Task Light to position light exactly where needed for optimum benefit. Range of Movement. Weighted Low Profile Base: The Vamp LED Task Light has a weighted base to ensure stability. 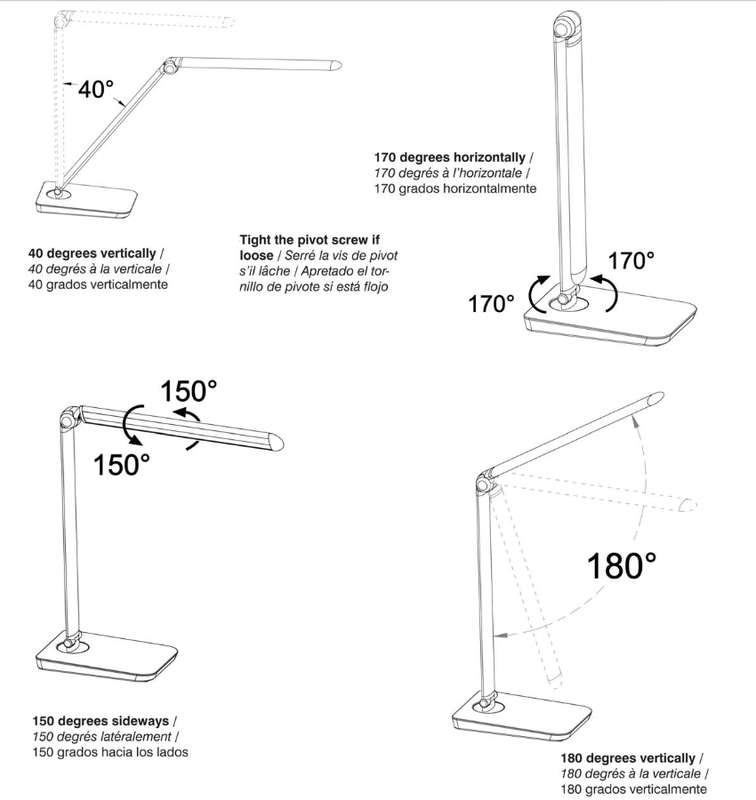 Note: Extending lighting head beyond recommended 40° may result in instability. 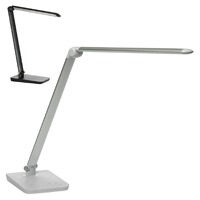 Adjustable Head: The head can be angled and rotated giving the user complete control of where they need the light most. Light Dispersing Lens: The lens on the Vamp LED Task Light serves to provide even dispersal of light with the accompanying reduction or elimination of both glare and shadows. Energy Efficient: The Vamp has a total energy consumption of 9W when operating at maximum illumination levels. Convenient USB Charging Port: The base of the Vamp includes a single USB power outlet for convenient charging of USB devices. Available in Two Colours: The Vamp LED Task Light comes in the colours Black or Silver (with white accents). Storable Design: The Vamp can be folded away to store directly above the base when not required or when unimpeded workspace is required. Environmentally Conscious: The Vamp is free of mercury and lead, low in energy consumption (just 9 watts maximum), and emits no potentially harmful UV radiation.